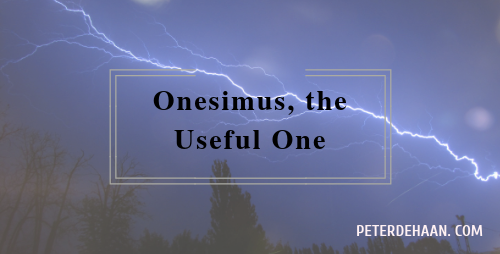 After Onesimus flees, he encounters Jesus through Paul. Paul mentors Onesimus and the two begin working together. However, it is not right for Onesimus to remain with Paul—even though what they are doing is important. To do so would be to defraud Philemon of Onesimus’s labor. So Paul encourages Onesimus to return to his master, despite the risk it involves. A recaptured slave could have been punished or imprisoned for an attempted escape. To facilitate a positive reunion, Paul writes a letter to Philemon, pleading that mercy be accorded Onesimus. While we don’t explicitly know the outcome of this drama, we can reasonably deduce it. First, Paul’s petition on Onesimus’s behalf is so powerfully worded that it is hard to image anyone not complying. Second, in the only other mention of Onesimus in the Bible, Paul announces that he is sending Tychicus and Onesimus to the people of Colossi. Paul also affirms Onesimus as being faithful and a dear brother. Since this trip could not have reasonably occurred prior to Onesimus returning to Philemon, it can be safely assumed that Philemon did as Paul requested, allowing Onesimus to return to Paul to work with him on Philemon’s behalf. This would put Onesimus in a position to take a trip to Colossi. At last Onesimus can be useful indeed—to both Paul and Philemon, as well as to the Colossians and to God. This all happened because he did the right thing, returning to his master despite the risk.